The HDMI to VGA converter is compatible with laptop, TVBOX, or other devices with HDMI port. VGA female port can be connected to projectors , HDTV, monitors/Displayer and other device with VGA male port. now buy on gearbest is normal. This product in a physical store more than twice the cost. this seller has allowed me to save money. the product is make with solid plastic and it do his work pretty well. I can connect a second monitor with the best resolution it can support. I use this reductor in combo with another reductor minihdmi to hdmi and works anyway pretty well. I am just adding this line because Gearbest requires at least 100 characters of cons even though I have not enough cons to speak about. I am just adding this line because Gearbest requires at least 100 characters. It comes protected with a poor quality plastic which in my case was already scratched. However the product is in good quality. 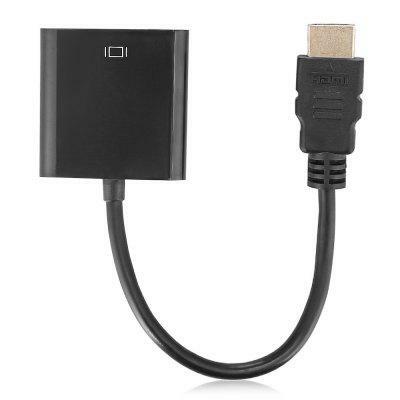 Good quality, simple to use, just connect the HDMI interface to the box or laptop and the DSUB (VGA) interface to the cable connecting to the monitor. This cable makes the correct format conversions with no need to configuration. Automaticaly adapts to the best image resolution. I tried a android box and a laptop using HDMI to a LCD using a VGA port, with no problems. Excellent transition in a beautiful package. The VGA connector is not screwed, and in this it is fixed. The advantage of an adapter of this type is that it does not break the connector of the device with its weight, unlike the adapters in a monolithic case in the form of a flash drive.